You are here: HomenextTransportnextTransport - shipsnextARYA TAB in Tilbury. 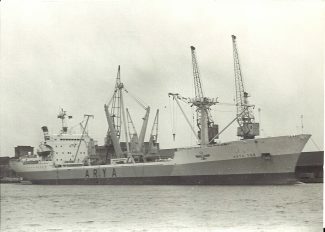 The Iranian ship ARYA TAB in Tilbury. She was built in 1972 for the Arya line of IRAN. She had a 12,015 grt. Note the twin funnels at an angle.